Finding natural approaches to sustain agriculture and food production is a major global challenge. Synthetic chemical pesticides have traditionally been used to protect crops, but there are growing concerns around their toxicity and the threat they pose to ecosystems. Using genomic techniques, the team of researchers discovered that Burkholderia ambifaria bacteria have the potential to be used as biopesticides that are both effective and safe. Biopesticides offer a natural means of protection and the group of bacteria called Burkholderia have been successfully used to protect crops against diseases. However, in the 1990s, Burkholderia bacteria were linked to serious lung infections in people with cystic fibrosis (CF), leading to concerns about their safety and eventual withdrawal of these biopesticides from the market. "I have been working with Burkholderia for many years, primarily in relation to CF lung infections, which in turn led to a new line of antibiotic discovery research," explained Professor Eshwar Mahenthiralingam, lead researcher on the project, from Cardiff University's School of Biosciences. "Working with plant scientist, Professor Jim Murray, Head of the School of Biosciences, and Doctoral Training Partnership student, Alex Mullins, we decided to take this research in a new direction, investigating Burkholderia-plant interactions and how they protect plants against disease. 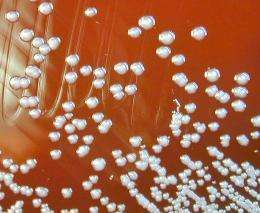 "By sequencing the genomic DNA of the bacteria, we were able to identify Burkholderia's antibiotic-making gene, Cepacin. Further testing demonstrated that Cepacin offered highly effective protection against damping off—a horticultural disease caused by a fungus-like organism." Using genetic engineering techniques similar to those used to produce live vaccines, the researchers are also exploring how to improve the safety of the bacteria. "Burkholderia split their genomic DNA across 3 fragments, called replicons," said Professor Mahenthiralingam. "We removed the smallest of these 3 replicons to create a mutant Burkholderia strain which, when tested on germinating peas, still demonstrated excellent biopesticidal properties." Further work showed that this Burkholderia mutant did not persist in a mouse lung infection model, opening up the possibility of constructing biopesticidal strains that are incapable of causing infection but can still deliver effective plant protection. In collaboration with chemists, Professor Greg Challis and Dr. Matthew Jenner, at the University of Warwick, who helped discover Cepacin, the team recently obtained a grant award of over £1 million from BBSRC. This will help progress the next stage of research to develop an effective and safe biopesticide that does not build up to harmful levels in the environment. "Beneficial bacteria such as Burkholderia that have co-evolved naturally with plants, have a key role to play in a sustainable future. We have to understand the risks, mitigate against them and seek a balance that works for all," continued Professor Mahenthiralingam. "Through our work, we hope to make Burkholderia viable as an effective biopesticide, with the ultimate aim of making agriculture and food production safer, more sustainable, and toxin-free." The research 'Genome mining identifies cepacin as a plantprotective metabolite of the biopesticidal bacterium Burkholderia ambifaria' is published in Nature Microbiology.